Luke Tichi of Durango High School tees off on Tuesday during the Dalton Ranch Invitational. Tichi has balanced golf and cross-country this season while excelling at both for the Demons. Luke Tichi has some stiff competition on the golf course and running trails in and around Durango. The junior at Durango High School has found a way to excel at both golf and cross-country this season, and a large part of his competitive drive is coming from within his own family. Luke’s younger brother, Levi, a freshman at DHS, is the Demons’ No. 1 varsity golfer this season and has shot in the 70s in every tournament this season. 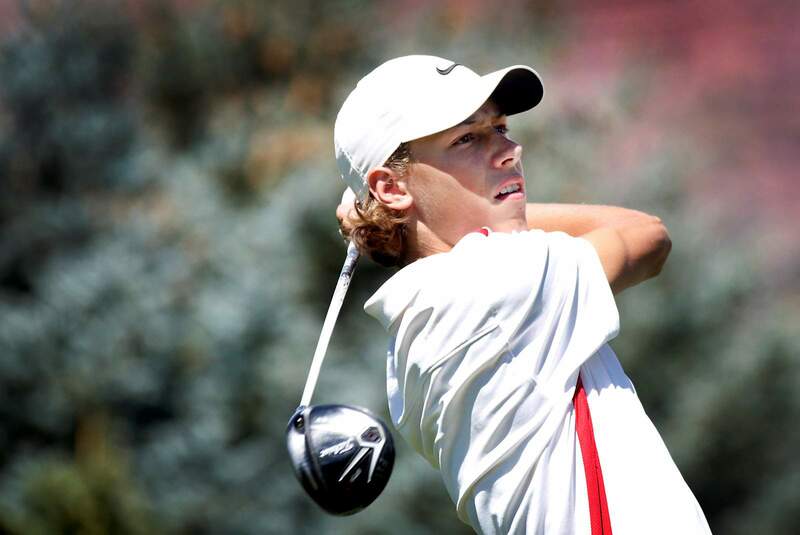 But Luke is not far behind, and the junior hopes to make a second consecutive trip to the Colorado High School Activities Association Class 4A state golf tournament later this month. 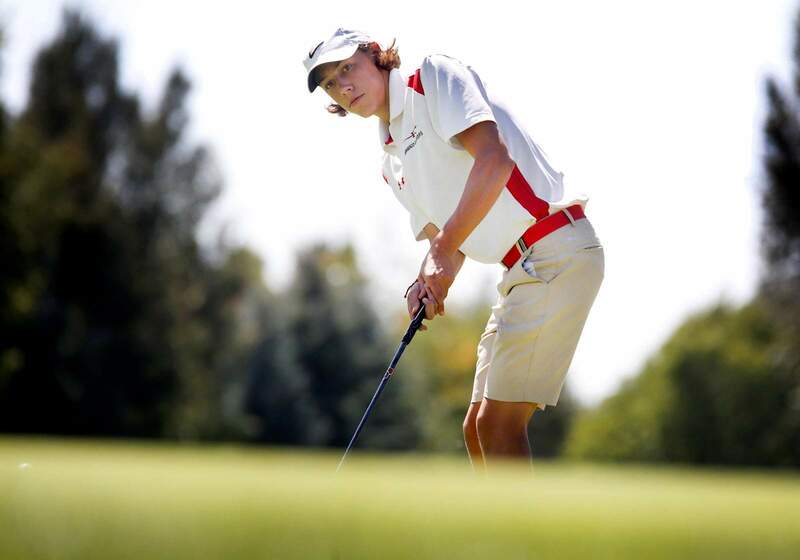 After a slow start to the season, Tichi found his swing at Monday’s Hillcrest Invitational. He shot 6-over-par on the front nine but rebounded and played a bogey-free back nine, with a 2-under par performance. He birdied Nos. 6, 10 and 17. The solid round came after his best performance of the year in cross-country, as he achieved a personal best for the Demons at the Liberty Bell Classic with a 16-minute, 35-second 5-kilometer race that helped Durango to a sixth-place finish as a team. He bested his previous best time by 1:16 seconds. Luke Tichi of Durango High School was the low Demons at Monday’s tournament at Hillcrest Golf Club. He shot 2-under-par on the back nine with three birdies on his scorecard. Demons cross-country head coach Ken Flint said that balancing the demands of being a two-sport athlete in the same season can be a struggle, but it makes the competition that much more exciting. Tichi’s schedule is demanding. He spends two to three days a week on the golf course and then puts on his running shoes to practice with the cross-country team two to three days per week. During the first week of school, Tichi, son of Kerry and Mike Tichi, missed the first five days because of sports with either the golf or cross-country team. He has since adjusted to the hectic schedule and managed to find time for each sport. During a two-day golf trip to Grand Junction earlier this season, Tichi ran on the hotel treadmill instead of going for a swim with his golf teammates. 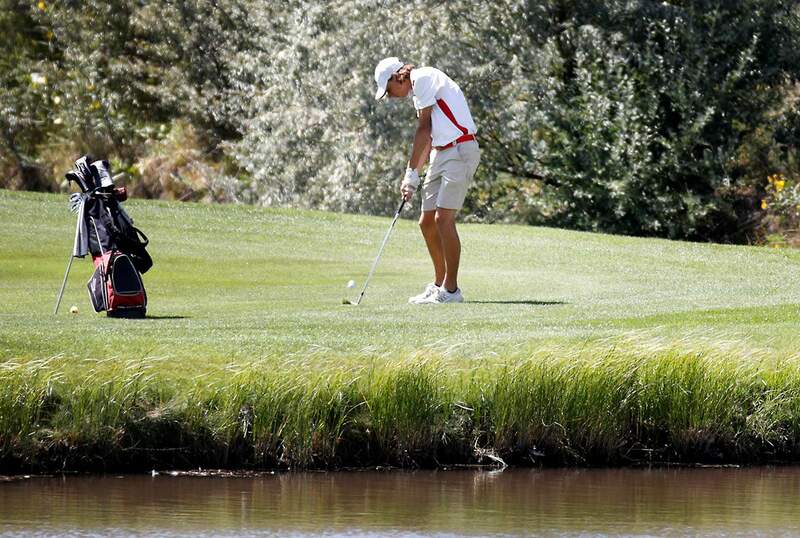 Luke Tichi of Durango High hits over a water hazard on Tuesday during the Dalton Ranch Invitational. Being an upperclassman on a team that will look to advance to the state tournament can be filled with plenty of pressure-packed moments. But DHS golf coach Kirk Rowles has been impressed with Tichi’s leadership and constant desire to improve – even if it is small things such as communicating with the team. No matter what route Tichi decides to go – toward the trails or the greens – he knows that either will make him happy. Tichi wears a “Kenya” bracelet that was given to him by fellow cross-country teammate Noah Bodewes after a trip to the African country during the summer. He wears it at every golf tournament to give him a reminder that he has more than one path to choose from. “I think the big thing about being a two-sport athlete in the same season is picking times to manage (each sport),” Tichi said. “The bracelet reminds me that no matter what happens on the golf course, I’ve got running, and vice versa. If you could have any superpower, what would you pick? : To not ever be tired because then you’ve got 12 extra hours every day. I’m always energetic. If you could take a trip anywhere in the world, where would you go? : Somewhere more remote in Europe, like Ireland. What teacher has had the greatest impact on you? : My eighth-grade math teacher, Mr. Andrew Dejong.